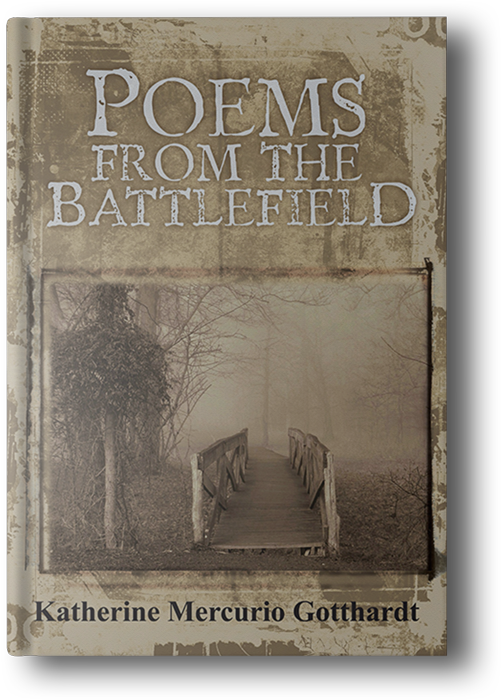 Poems from the Battlefield captures unique aspects of the Civil War in Manassas and Prince William County, Virginia. Using persona, metaphor, photos and quotes, Gotthardt brings readers from contemporary park experiences back to the days of the Civil War, offering multiple perspectives and insight. The book is in the top 100 of the Amazon Best Seller's rankings for its genre. "In some poems, you might recognize relationships between past and present historic struggles with our current domestic climate of fear that prevents us from being our very best selves. I don't seek to relay details of history or battles. What I'm offering is a collection of impressions, images, and emotion - as well as obvious bewilderment at how easily we invite our own destruction." War, innocence. Arrogance, intolerance. Gotthardt’s slender volume is a portkey to another time, but the issues she explores are timeless. Whether you care for Civil War history or not, you will still enjoy this book. Through her poetry, Gotthardt exposes the less often explored sides of war and in particular the individual struggles faced by those who went to war. If you happen to live in the Manassas area, or have experienced the battlefield, you will relate to the conflicts that the present day Northern Virginia lifestyle bring to the peace and serenity of the battlefield.